Short on time? Follow this link to a Google Maps version of our 3 day Sydney itinerary with all of our favorite spots labeled! You can “follow” the guide, and the saved locations will automatically transfer to your own Google Maps account. On our recent trip to Australia, Tyler and I met my sister Miriam in Sydney for a few days to explore. As we planned for our recent trip, a lot of people told us that Melbourne is the place to be. However, we thought Sydney was absolutely gorgeous. We think it’s an essential stop on any itinerary for a trip to Australia. The beaches (Bondi, Manly, Shelly, just to name a few…) are insane, showing off blue-green water and soft sand, and we ventured to as many as we could in our three days in Sydney. The harbor is the city’s crown jewel, in our opinion, so a lot of our recommendations center around getting out on the water and enjoying the views. But instead of paying for a pricey harbor cruise, we suggest utilizing the easy ferry system! There are stops all over the city, and it costs $7 for each trip (or $6 if you prepay on an Opal Card–definitely do that). In fact, there was a bit of a theme during our time in Sydney. We were really trying to save money on this trip. And since food/everything is so expensive in Australia, we wanted to spend as much time walking around and finding pretty views as we could! Fortunately, Sydney is the PERFECT place for walks and stunning views. We kept having these “Oh my gosh it’s SO pretty moments” in Sydney. You know what I’m talking about: time seems to freeze and you’re just so blown away by the beauty around you. We had a few of these moments on the ferry at sunset or at a few of our favorite lookout points (details below, don’t worry). Tyler’s thing in Sydney, usually during one of these moments, was yelling at the top of his lungs “MY CITY” (but really more “MAH CITAYYYY”). Embarrassing, but Mir and I were on the floor cracking up every time he did it. We used Bondi Beach as our base and highly recommend it. We loved Bondi so much that we gave it an entire post, so you can read more about that dreamy beachtown here. 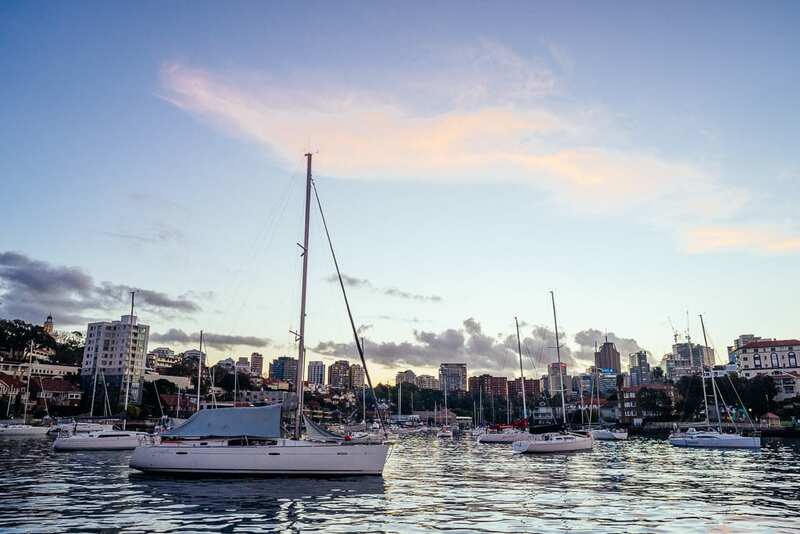 In today’s post, we are talking about our favorite things about the rest of Sydney. TONS of sites and blogs mentioned ferrying to Watson’s Bay, and we are so glad we decided to check it out. Since Watson’s Bay is pretty close to Bondi Beach, we decided to just drive over, rather than taking the ferry–which is what most people recommended. This worked out because we got a free parking spot for the day (very hard to come by). We left our car there all day and ferried from Watson’s Bay over to Circular Quay in the city center and then back later that evening. Grab a drink on the patio or in the juicy upstairs bar at the Watson’s Bay Boutique Hotel. The decor and vibes were on point here, and we loved just taking a moment to relax and take in the views. It rained on us, so we opted to sit inside, but the patio is perfect for a warm summer evening. We also parked at Kirribilli, a quiet neighborhood across the Harbor Bridge from the CBD, a handful of times. It’s easy to find a free two-hour spot in this neighborhood, so we took advantage and parked here and used it as a base to explore. There is a really cute little cafe called Celsius Coffee on the dock at the ferry stop where we got coffee and breakfast one morning. Our favorite little lookout point was at Dr Mary Booth Lookout Reserve, just a few minute’s walk away from the ferry stop. This park provided the perfect view of the harbor and the Opera House, and we had it completely to ourselves! My FAVORITE thing we did in Sydney was when we hopped on the ferry at Kirribilli at sunset. After the ferry picked us up, it circled over through Neutral Bay before turning back and gliding by the Opera House towards Circular Quay. It was thirty minutes of sunset perfection and the most gorgeous views. Please, please do this. It took me way too many days into our trip to finally Google what “CBD” actually means (“central business district” by the way), but it’s what they call the main downtown area of the city. Since we hopped on and off the ferry several times at the main station, Circular Quay (apparently pronounced “key,” of all things) in the CBD, we found ourselves hungry and looking for a good meal in the area a handful of times. Our favorite meal in Sydney (maybe the whole trip?) was at Mr. Wong on our first night. We searched for “best dumplings in Sydney” and this came up on every list. After a quick vote (so nice having a third person along as a tiebreaker), we decided to make our way to Wr. Wong to see what the fuss was about. The fuss is warranted, although the menu is on the pricey side. This was such a fun experience, though, and the restaurant is huge and has the coolest vibes. We stuffed ourselves with a few incredible Cantonese dishes and practically crawled out the door. For a quick lunch, head to Marlowe’s Way, and don’t think twice before ordering the ham and cheese toastie. Though nothing can compare to my favorite toastie in the world from Borough Market in London, this one was AMAZING. Another place we loved in the CBD was Bar Luca. Miriam was craving a burger one night (aren’t we all, every night?) and found this spot in the CBD. We were starving after having walked all day, and the burgers and fries here just really hit the spot. The Rocks is a historic neighborhood really close to Circular Quay and just northwest of the CBD. Walk the cobblestone streets and check out all of the fun shops and restaurants. If you find yourself in Sydney on a weekend, don’t miss The Rocks Weekend Market, and definitely check out The Rocks Discovery Museum where you can learn all about Australia’s history for free. We ate breakfast at Fine Food Store in The Rocks and highly recommend. I think it’s worth noting here that TONS of travel blogs recommended Pancakes on The Rocks as a must-eat in Sydney. However, we discovered it to be exactly like IHOP in the U.S. and we dipped out before they took our order. Another awesome area to explore in Sydney. Take the ferry from Circular Quay over to Manly Beach. There’s tons of cute restaurants in the area, but we got a couple of really amazing poke bowls at Momo Bar for lunch and then a coffee at Barefoot Coffee (definitely recommend the flat white here). Then, make your way along Manly Beach until you reach the pathway that leads to Shelly Beach. The walk takes about 10 minutes and journeys past some incredible homes that I’m still dreaming about. We learned that Shelly Beach offers the best snorkeling experience in Sydney, so definitely do that if you’re there in the summer. We got a drink at The Boathouse bar and restaurant in Shelly Beach and were obsessed. The decor is so cute, and the view from the outside patio is amazing. This was definitely one of our favorite things we did on the whole trip. After just the loveliest happy hour, we kept following the path to the lookout point. This was another spot some people told us we’d “see whales” from, but we’ve already discussed our bad whale luck in our Bondi Beach guide. Wake up early and grab breakfast at Smoking Gun Bagels before heading over the Royal Botanic Gardens. Breakfast can be pricey in Sydney, as discussed, but this place has a great deal for an amazing bacon/egg bagel sandwich and a coffee for $10. Take your time walking through the massive garden, and then walk over to Mrs. Macquarie’s Chair. This spot provides one of Sydney’s best views of the Opera House and Harbor Bridge. We could have stayed for hours (and probably would have if we weren’t trying to dodge a middle school field trip). We ended up loving our approach to Sydney: lots of walks, lots of views, and lots of good food.